A challenge in special education is that the terms ‘adversely affected’ and ‘school performance’ are not terms that have been specifically defined in federal or state law, so there can be variation in how those are interpreted from school to school. That means a student in one school may be identified for special education, whereas if they were in another school, they may not be identified. WHAT IS A FREE AND APPROPRIATE PUBLIC EDUCATION? An appropriate education may comprise education in general education classes, education in general education classes with the use of individual supports, or special education and related services in separate classrooms for all or portions of the school day. Special education may include specially designed instruction in classrooms, at home, or in private or public institutions, and may be accompanied by related services such as speech therapy, occupational and physical therapy, psychological counseling, and medical diagnostic services necessary to the child’s education. Least Restrictive Environment (LRE) is a principle that guides the provision of special education services. LRE is an educational setting that prioritizes the inclusion of students with disabilities in a general education setting with their peers without disabilities whenever possible. In other words, special education students are general education students first. The public school system must provide the required services and supports to every school-aged child with a qualifying disability, regardless of available funding. Prioritizing special education will help move us towards a more equitable and just education system. An IEP outlines what special education services and supports each student with a disability needs, as identified through an evaluation of a student’s strengths and areas of growth, in order to access a free and appropriate public education. An IEP guarantees certain legal protections to a student and their family as a student accesses a free and appropriate education. The team involved in developing, maintaining, and amending a student’s IEP includes: a parent or guardian, at least one of the student’s general education teachers (if applicable), a special education teacher, a qualified district representative, a person who can interpret and relate evaluation results, a student (if appropriate), and other individuals as determined by the district or parent/guardian. The program of special education is part of the program of basic education and therefore is part of Washington’s paramount duty. But our special education system is not adequately funded and resources are not effectively deployed, forcing local education agencies to have to backfill with funding from other, potentially unreliable sources, such as local levy money that should be allocated for other purposes. 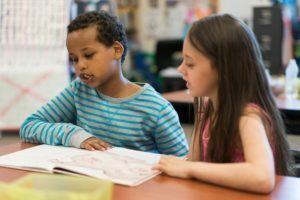 We believe Washington state needs to assess and adjust how we accommodate and support the diverse and complex needs of students in public schools. Human potential is our state’s most important asset. When we design schools and learning to be accessible and inclusive, we reach the greatest number of learners – and ultimately benefit from what they later contribute to our communities. Build capacity of school staff and empower educators to support diverse learners and better meet the needs of all students. Build capacity and confidence of all students – including those with disabilities – to transition to post-secondary education, work, and life. Learning must be accessible. We do this by taking into account the physical space, communication and sensory needs, and social-emotional needs. Make sure the right supports and resources are available in every school. Every student should get what they need, when they need it.